Did you know that those unhealthy and costly disposable plastic straws have been banned in multiple countries? Did you know that you can save your money, do your part for the environment and support your health by choosing a set of reusable metal straws? Introducing The Ultimate Set Of Stainless Steel Drinking Straws By Mengya! 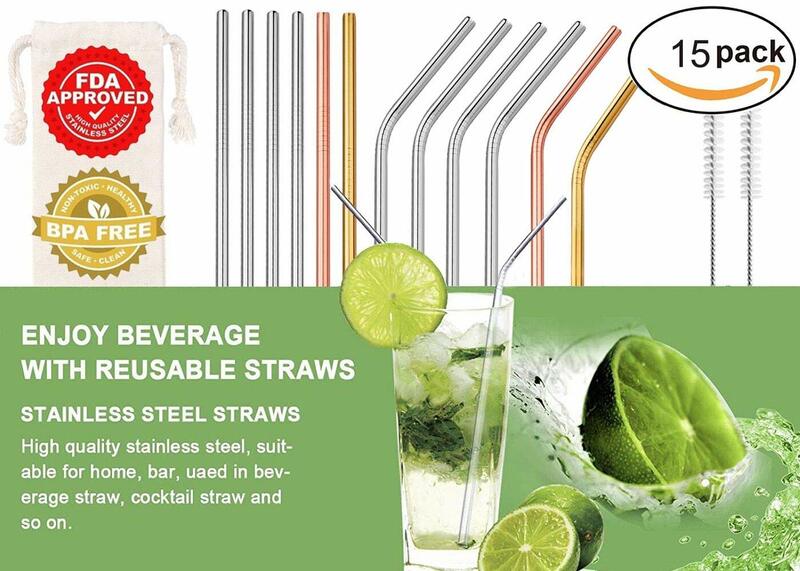 Now you don\'t have to settle for all those low- quality and unhealthy plastic straws anymore, since our metal straws 12-pack is here to cover all your drinking needs while saving you a small fortune! Why Choose Our Heavy-Duty & Practical Metal Straws? SUPERIOR-QUALITY CONSTRUCTION - our stainless steel straws are rustproof, odorless and leave no metallic aftertaste. PERFECT FOR ALL DRINKS & BEVERAGES - including rum, whiskey, gin, tequila, cocktails, smoothies, fruit juices, milkshakes, water, coffee or iced tea. IDEAL FOR ALL GLASSES & TUMBLERS - our 10.5-inch straight/bent metal drinking straws are perfect for highball, hurricane or coffee glasses, tumblers, cans or even small bottles. MOM- APPROVED DESIGN - cleaning the Mengya metal smoothie straws is a breeze, since the set includes 2 x convenient cleaning brushes for maximum results. ECO-FRIENDLY & REUSABLE - instead of running every other week to the store to buy plastic straws, you can invest in our reusable metal straws once and for all. If you are not 100% thrilled with your metallic straws, we will buy them back from you at full price! Click \"Add To Cart\" NOW & Get Your Stainless Steel Tumbler Straws 100% Risk- Free!